We've noticed a new breed of gift box companies arrive on the shopping scene. Boxes with items that give back to their maker or a specific charity, items that support a local business and/or earth-friendly items. We're featuring our favourite gift boxes for all occasions, so if your lacking inspiration or time over the holidays, consider one of these gift boxes! FENVII Collective is a Calgary based social enterprise that curates high quality, ethically-made artisan items from around the world. Every item in each box contributes to creating empowering working conditions in the item's place of origin. 100% of profits benefit development initiatives in both Calgary and Sri Lanka. This Kenyan-made olive wood dish empowers Kenyan wood workers to make a living from traditional craft forms passed through many generations. The journal featured in this box is by Flora Stationary, a nonprofit organization that sells stationary products featuring original artwork from students in Kosovo to support a scholarship fund for women pursuing post-secondary education in Eastern Europe. FENVII's soy candles are hand poured by Burmese refugee women living in the US who are paid a living wage to enable them to build a bright future for their families. FENVII's inspiration pencils offer a dose of motivation and positivity in the palm of your hand. FENVII Collective's boxes are a delight, even at first glance. Ours came flawlessly wrapped and contained elegant, one-of-a-kind items. We appreciate that they ensure each piece tells a compelling story about the place it was made while supporting dignified working conditions for the maker. Our Daily Brett is a foodie's dream with a box full of "good honest food" from local and artisan sources as well as high quality kitchen items. Rhosyn Floral creates unique and trendy gift boxes featuring locally sourced products, fresh floral arrangements and boxes made from sustainably sourced wood. Old Joy offers customizable gift baskets with goods "hunted and gathered from Canada and the Pacific North West". Old Joy wants to provide the gift giver an opportunity to bring joy through the gift of thoughtful, ethical, treasured gems. 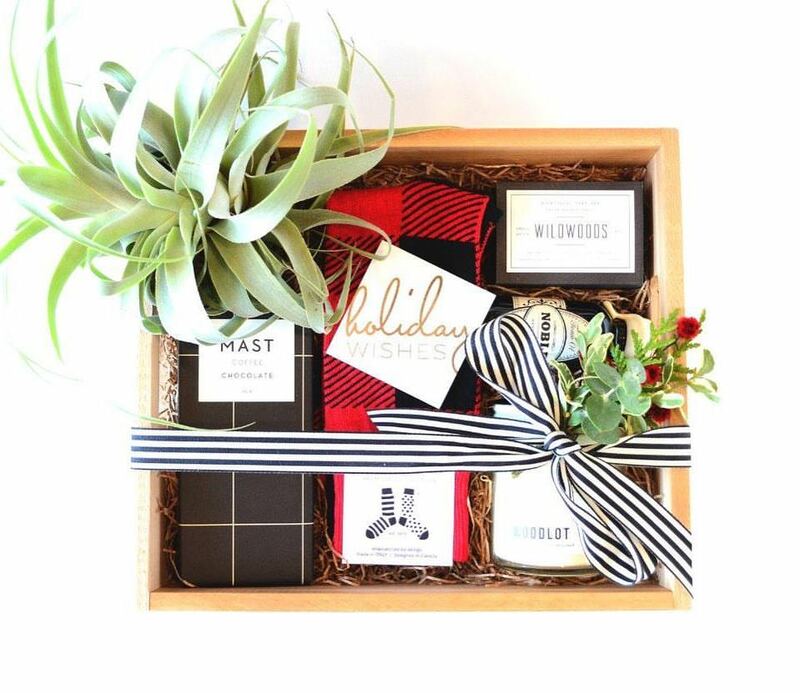 Saul Good Gift Co. includes items from Vancouver and Canadian businesses while also supporting local social enterprises including Starworks packaging and assembly, East Van Roasters and Tradeworks Custom Products. Their large selection of boxes even includes "Alberta"-themed, "Canada"-themed and Christmas themed choices. Giving Crates specialize in eco friendly and fair trade treats and gifts. Their Vancouver store front features over 50 artisan vendors. Giving Crates will also customize a crate for you, working within your theme and budget. Present Day Gifts is a gift box company with a modern edge, featuring locally sourced and unique items. Shop Present Day's beautiful assortment of ready-made boxes or collaborate with them to make an especially meaningful gift that suits your gift-giving desires. The multitude of mindfully-made gift boxes we've found have brought a hefty dose of cheer to our gift giving as we find encouragement in these entrepreneurs taking extra care to ensure a variety of ethically and locally made products find their way to deserving recipients.